Thinking of going into the Cloud? Let us guide you through this powerful technology. We supply firms like yours with hosted Exchange, team file-sharing, managed cloud storage and backup, Office apps, and other cloud services. ​The Cloud. You’ve heard about it, but do you really know what it is, or more importantly, how it can help your business? Tech Force has the answers, with the IT and business expertise you need to simplify your transition to the cloud. Transferring your technology to the cloud simply means that the physical aspects of your IT – along with their management and maintenance – are delivered via the Internet on a pay-as-you-go pricing structure. Why Does Your Business Need "The Cloud"? Many progressive companies are implementing services through the Cloud to gain more than just mobility. Cloud-based solutions are shortening the technology gap between small and large companies as it enables users to leverage enterprise grade solutions at small business prices. Always up to date, wherever you access it. Exchange is a business-class email platform that syncs emails, calendars, and contact information across your devices in real time. So it’s always up-to-date, no matter what device is in your hand. Stay in sync with Microsoft Exchange. Simple, secure, cloud-based folder and file sharing---even with people who don't have it installed. Cloud storage boosts mobility by keeping files and folders up-to-date and accessible from anywhere using Windows, iPads, iPhones, Androids, and Macs. ​Secure unlimited file sync & share with enterprise features and instant communication and collaboration features built-in. Get the latest versions of Word, Excel, PowerPoint, Outlook and more. Powered by Office 365, Tech Force office apps is available for desktops, mobile devices, and the web. Available through a flexible monthly subscription, Tech Force apps is always up-to-date. This service offers businesses all the productivity software they need plus a solid platform for their communications. Cloud Consulting: It’s OK to be unsure about technology as new as the Cloud! A healthy dose of caution is always recommended when considering a new technology for your business, but why bother taking any risks? Tech Force is an industry-leader in providing Cloud solutions, and we want to help you find just the right application of this new technology to help your business do more. File Sharing in the Cloud: By sharing your files through the Cloud, you gain far wider access and control over them from any configured workstation or device, without any loss of security. Tech Force can provide your business with file sharing capability that allows your employees to collaborate, share and revise information with greater ease from any location. What’s more, with powerful encryption and control over the data, there’s no further risk for you to deal with. IT Monitoring In The Cloud: By actively monitoring your IT infrastructure around the clock, Tech Force can identify and neutralize any threats or issues as they happen. This helps to keep your system running and your employees productive. Hosted Solutions: By hosting your servers, desktops and data with Tech Force through the Cloud, you can benefit from reduced onsite hardware and increased backup capability. Instead of keeping costly and space-consuming servers on site, you can host them virtually through the Cloud. Furthermore, backups in the Cloud present a valuable fail-safe in case your onsite data is compromised during an emergency. Microsoft in the Cloud: You’re likely using applications such as Word, Excel, and Outlook, to get work done on a daily basis already. Now imagine how useful those apps would be when fully configured in the Cloud. 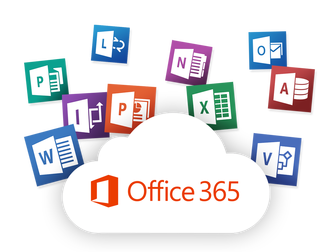 Tech Force is here to help you leverage Microsoft Office 365, featuring 99.9% up-time guaranteed, scalable services that fit your business, and greater ability to collaborate and work remotely. With Microsoft Exchange Online, Tech Force can put your business’ email in the Cloud as well, which offers greater access to your mail from mobile devices and remote workstations, and better control of your information with email archiving, and more. on virtually any device you choose. Manage emails. Share files. Join meetings. Stay in sync with your team. When there’s work to be done, your office is right there. Learn more about what Cloud Computing can do for your company.